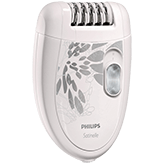 Epilators offer a better way to keep skin smooth for longer, and the Philips HP6401 epilator promises an efficient home epilation system that removes hair from the root. The Philips HP6401 Satinelle is made in a compact white plastic casing with attractive gray splash graphics. There is a sliding on/off button near the edge of the epilator. The epilator is reasonably priced. An epilator is a bit different than a regular shaver. Instead of shaving hair off down to the skin, the epilator actually grasps hairs, and pulls them out by the root. This leaves your skin softer and smoother, for longer. While there is some discomfort, the epilator is designed to do the whole process more quickly than if you decided to tweeze out your hair. It’s also more comfortable than waxing your legs. Using an epilator won’t irritate your skin like harsh hair removal chemicals or waxing can do. There will be no nicks or cuts, like if you used a traditional razor on your legs. The Philips HP6401 Satinelle epilator is used dry on your skin. You’ll want to ensure your skin is clean and dry before you use your Philips HP6401 Satinelle. You may wish to exfoliate your skin first, and use it in the evening, when your skin is less puffy. 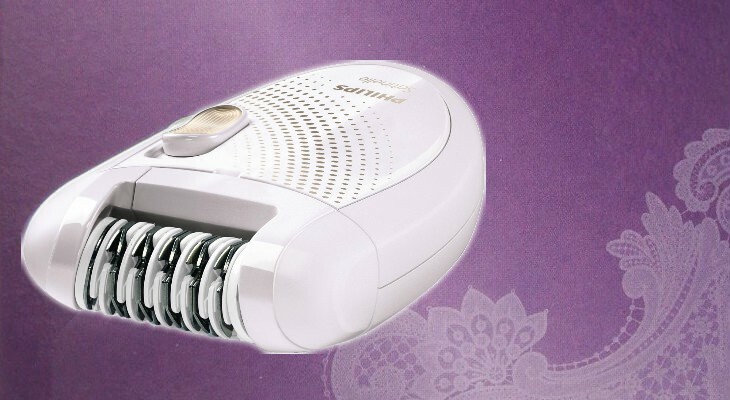 This epilator is completely cordless, making shaving your skin much easier. People have different experiences when using an epilator. For some, there may be discomfort at the beginning, but as they get used to epilating, they soon only feel a tingling sensation. For others, they never seem to get used to it, and feel a lot of pain. It comes down to personal preference, and whether a bit of discomfort is worth clean smooth skin. After using your Philips HP6401 epilator, you could have smooth, clear legs for several weeks, or wherever else on your body you decide to use your epilator. 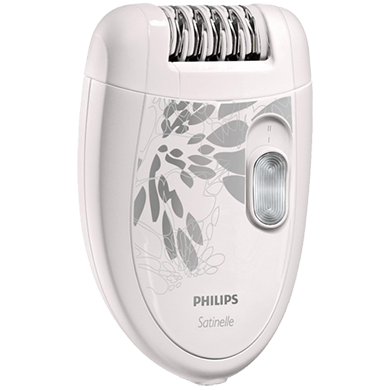 The Philips HP6401 epilator is designed to be a full body epilator, so you don’t need to buy more than one product to remove your body hair. To use it efficiently, you’ll place the epilator at right angles to your skin. You then shave against the direction of hair growth. An additional benefit is that when hairs are repeatedly pulled out at the root, they often stop growing back in. An epilator will effectively remove long hair, or hairs as short as half a millimeter. If they’re shorter than that, you’ll need them to grow out a bit longer before you epilate. Hairs should be no longer than 1.5 centimeters. The optimum hair length for removal is three to four millimeters. The Philips epilator comes with a gray/mauve plastic efficiency cap, which can be used to shave in the most delicate regions of the body, including under arms, knees, and bikini line. You can choose from two different speed settings, to change the performance of the epilator. The gentle setting will gently remove hairs from under arms, or bikini line, while the efficient setting will remove hair more quickly from your legs. The Philips HP6401 is designed ergonomically, so it can be easily held in the hands during shaving. It has a smooth rounded shape, making it easy to hold in your hands for the entire shaving process, without worrying about dropping it. It’s simple to maintain your Philips HP6401. Simply wash it under a running tap after each use, then shake and pat dry with a towel. The head of the epilator easily removes, so you can clean it more efficiently. 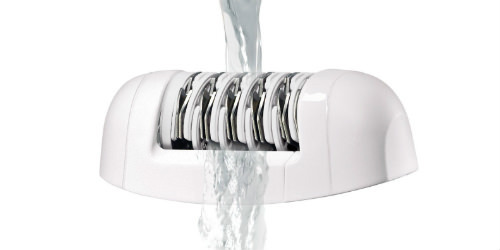 The casing is 100% waterproof, so you won’t have to worry about moisture getting inside, and ruining the motor. 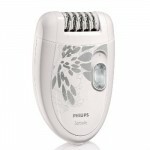 The Philips HP6401 epilator is backed up by a two year warranty, which is pretty good for a product that’s inexpensive. In the package you’ll received one epilator, and an efficiency cap. If you hate shaving every couple of days, you may prefer to use an epilator to keep your skin clear for longer. The Philips HP6401 Satinelle is an affordable one for you, and can help your skin to be smooth and clear for longer.